Hey guys! How was your weekend? I had an awesome one! The weather could not have been any more perfect, which is one of the reasons that I ended up running a half marathon on the spur of the moment. 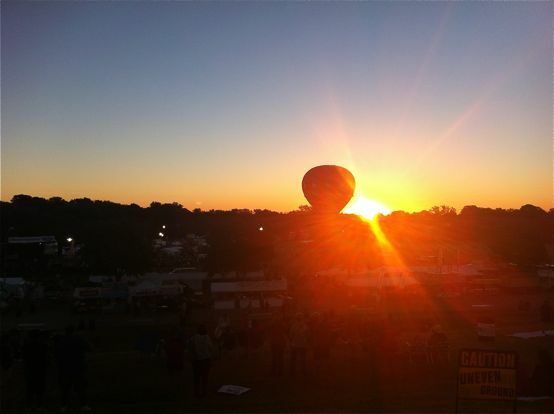 You see, my brother sent me a text a few days ago and told me that he was running the Plano Balloon Festival Half. 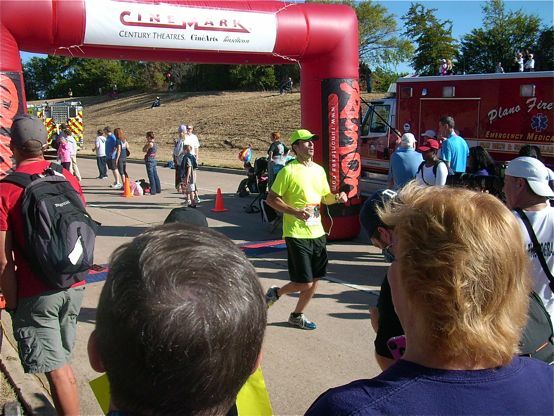 He had originally planned to run the 5k, then decided to switch to the half at the last minute. Running the Wounded Warrior race with him was really fun, so one thing led to another, and by Friday afternoon I had one of these in my hand. After waiting several minutes to get into the parking lot, we finally met up with my brother and his friend. We walked down to the race site just as the sun was coming over the trees. Beautiful! My brother and his friend got in line for the porta potties just before the start of the race. I waited around taking pictures instead of doing what I should have been doing, which was use the porta potty myself. I’m a big germaphobe, so the thought of using one is just gross. This mistake would later come back to haunt me big time. We headed to the start line and took off. I stayed with my brother for a few minutes, but then he started making his way around people at a faster pace than I knew I could handle for very long. I decided not to try and push myself to try to catch up to him and just ran at my own pace. 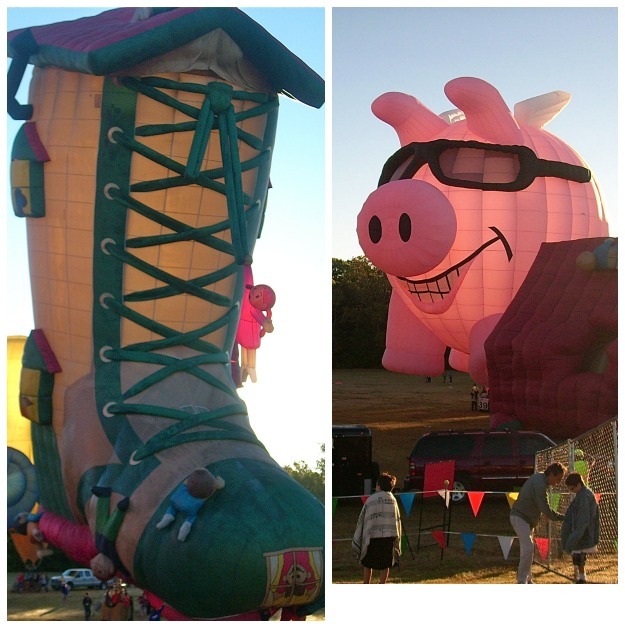 The first hill we came to was no fun at all, but at least we had the hot air balloons to watch while we climbed. My husband sent me an encouraging text at one point, and I told him I was struggling. After taking a salt tablet, I started feeling a little stronger. I did a little calculating in my head and thought maybe a PR was actually still a possibility. Oh, silly me. Around miles 9-10 is where things started to really go wrong. I had to pee, like really badly. I’d kind of felt like I needed to go before we started the race, so by this point things were starting to get dire. I had bypassed a few porta potties on the race course for the said reason above, and then just as I would have given anything to use one, there were no more porta potties. I thought about stopping at someone’s house to plead with them to let me use their bathroom. At one point, there were some woods that I thought about going into. If no one else had been around, I probably would have. I had a bottle of water with me, but I hadn’t been drinking much because well, you know. Feeling a little better, I ran the last 1.1 miles into the finish line. I hadn’t seen my brother on the switchback, so I knew he had finished well before me. I don’t know his official time because his didn’t get posted for some reason. I’m not proud of my time because it’s actually two minutes slower than the Wounded Warrior Half and almost 8 minutes slower than my first half. I had hoped to at least beat my second half time. If it hadn’t been for my potty break, I probably would have. But, like my brother said you ran, you finished. There is always another race. My brother and I after completing the race. A close-up of the race bling. We hung around for a little while after the race. There were a bunch of food vendors there for the festival, but food was the last thing I wanted at that moment. 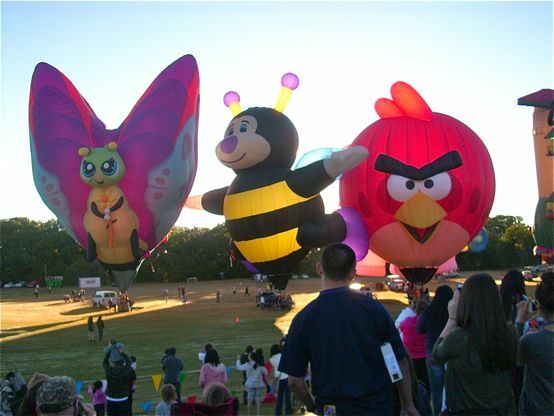 The Plano Balloon Festival had some really cute hot air balloons. They didn’t launch these particular balloons for some reason and just had them on display for the crowd. There were plenty of other ones that took off throughout the morning though. It was a great day, even with the (ahem) bathroom issues. The volunteers were great and the race course was awesome! Would I have signed up for it if I could do it over again? Yep. Porta potty and all. No matter how I do, I never regret doing a race. Especially, one that I get to participate in with my big brother! How was your weekend? Did you race? If you did race, how’d it go? By Tempie at September 22, 2013 . So you were the one who passed me up so fast! I ran this race as well and finished it in 2:20:58. This was my second half to run and liked it as well. 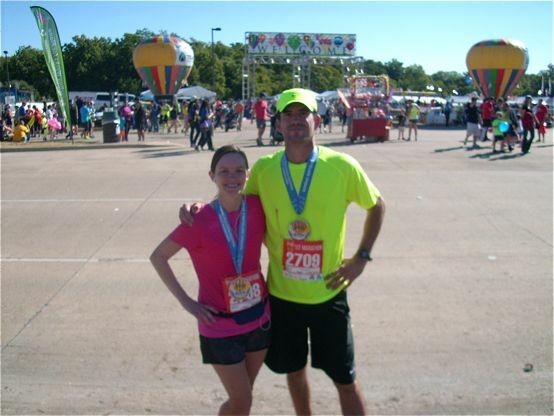 (The 5K last year was actually my very first race ever!) Not my best time as my first half was run in 2:12, but like you said, there is always the next race. Glad you finished and had fun! I just wanted to be done so bad at the end, and that is the only thing that kept me running at that point! 🙂 Congrats to you on finishing your second half! Oh no! Sorry to hear about your bathroom issues! That is a killer! 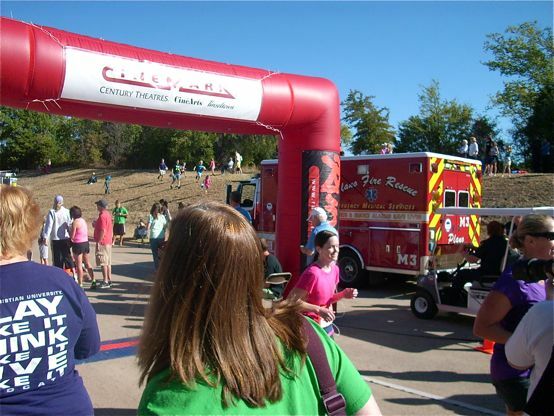 I had a similar issue at the Dallas Marathon last year at mile 25, but there weren’t any port-o-potties to be seen… I couldn’t even find them in the finisher’s area. Hope to meet you at another local race some time! Congrats on your half!! The potty issues sound awful- I’ve never had to stop to use the bathroom in a race, but I’ve had several emergencies like that in training runs… fingers crossed it doesn’t happen on race day! Yikes! Sorry about the bathroom issues. I hate having to use the porta-potties, but I think it is a pre-race tradition that cannot be ignored. 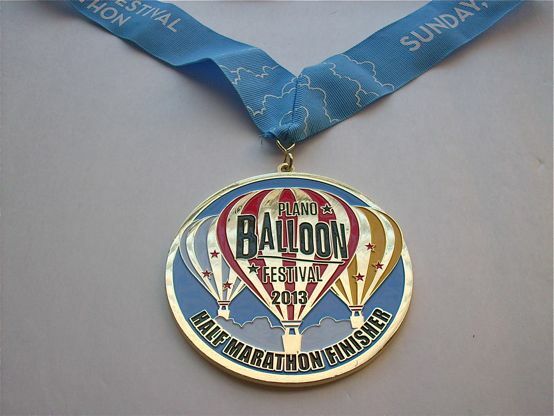 Great balloon pics and awesome medal! Congrats on the great race. I think I may do this one next year. Thanks, Julie! 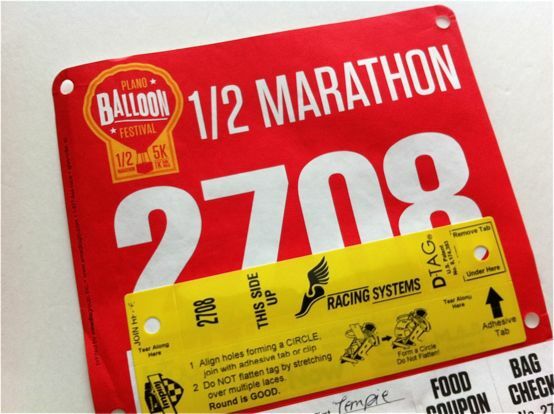 I think that is going to become a pre-race tradition for me too! Ha! How cool that your brother got you out for another race! This one really does look like a fun one with all the balloons. I’ve never seen any like the cute cartoonish ones in your photos! I hope your next race is more comfortable for you to run, but I’m glad you got out there. 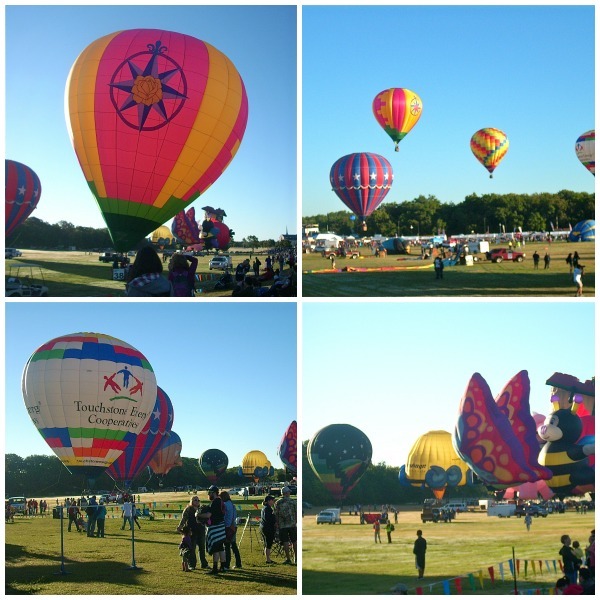 I had never seen any balloons in person like that either, so it was pretty cool! Definitely a neat finish to a long race! We are fortunate to have several great parks and trails nearby, so we’ve been trying to take advantage of them when the weather is nice. Must be great to live right next to one!